Despite being a remake of a Korean film, to Western viewers this movie will be highly reminiscent of Freaky Friday with it’s body swapping shenanigans. It might even be tempting to see it as containing some sort of social commentary, questioning how much our attitudes to old people are shaped by appearances. But to be honest, that would probably be reading far too much into it. The film’s name chóng fǎn 20 sùi means “go back to twenty years old”. 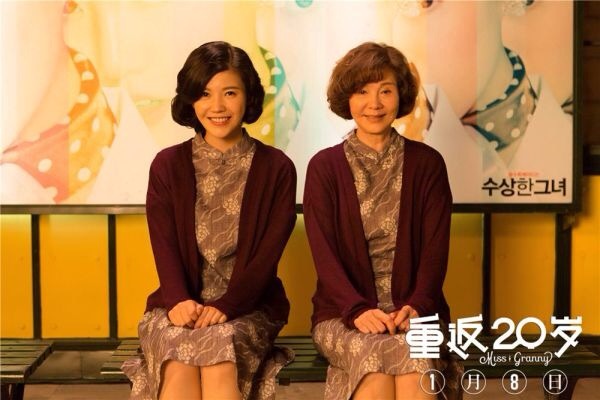 Without giving too much away, the basic plot is that 70 year old Chen Mengjun, an average mahjong playing OAP, stumbles into a mysterious photo studio where she is transformed back into her 20 year old self. For anyone who has spent time in China it is quite amusing to see the 20 year old Mengjun (played by the beautiful actress Yang Zishan) going around walking, talking and acting like an old Chinese woman. was your grandmother this hot at 20? For anyone who is not so familiar with China the joke might be lost a bit, as the stereotype of how old Chinese women act is slightly different to that of Western women. In a way this makes the movie quite useful for for the language learner as it also offers an insight into Chinese society. Even if it isn’t a particularly accurate insight. Expect the usual romantic interest elements present in any movie of this type. The most amusing of which being the grandson who, not realising it’s his own grandmother, falls in love and convinces her to become lead singer in his band. Of course his band are then forced to sing covers of cheesy Chinese pop songs from the 60s, which somehow propels them to stardom. The whole thing of course is ridiculous, but it’s a very entertaining ridiculous. To say it is the best Chinese movie of the year so far really doesn’t say too much since it’s only the second week of January and Chinese movies really don’t have a great reputation anyway. This entry was posted in movie of the month and tagged Chinese, chong fan er shi sui, miss grandma, movie of the month, movies. Bookmark the permalink.